Since she was a little girl, Haida artist Lisa Hageman Yahgulanaas' memories have been filled with weaving. Generations of renowned artists in her family keep her feeling humbled while striving to maintain a level of excellence in her chosen artistic field of Raven's Tail Weaving. Raven's Tail weaving is one of the oldest forms of textile weaving for the Haida and is one of the few styles of weaving in the world that is gravity-weighted finger-weaving. This means that there are no looms and no tension but rather loose strands of wool warp hand from a box frame while the weaver creates each stitch individually with their fingers. Lisa was accorded her master's level of weaving in 2009 from her mentor Master Weaver Evelyn Vanderhoop. 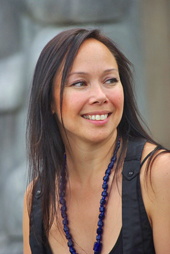 Yahgulanaas has exhibited throughout Canada, demonstrated internationally and been gifted with numerous awards. She is grateful for the opportunities that enable her to continue to create. "I weave because I could not do otherwise. Weaving dances through my dreams at night." 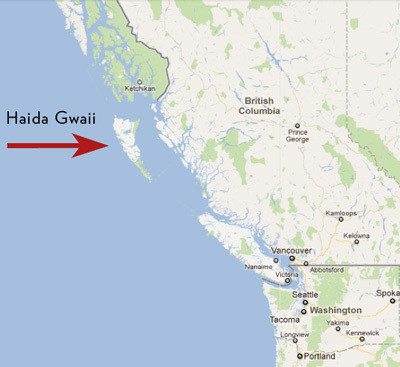 I am a member of the Haida Nation of Haida Gwaii and Alaska and reside on Haida Gwaii which is an island nation off the West Coast of Canada. I am a formally trained weaver specializing in the geometric style of weaving known as Yelth Koo or Raven's Tail. Raven's Tail is a gravity-weighted style of finger weaving which means that the warp, or strands of vertical wool, hang freely from a bar with no tension to control them. This means that the weaver must keep the weaving square with only the control of the hands. In Raven's Tail weaving each weft, or horizontal, stitch is created individually. This is very time-consuming. While I adhere to the strict and timeless guidelines for the techniques of Raven's Tail weaving, I do also utilize contemporary coloration and create new patterns as an example of how weaving can remain ancestral and yet also change and expand to a new horizon. I utilize the finest of wools and personally thigh spin the warps for each of my creations. Haida people strongly believe that the spirit of the artist is included in each creation and thus I am firmly committed to preparing my own warps as they become the foundation upon which the entire weaving rests. In this fashion, I can also ensure the uniformity and therefore the quality of the prepared materials. Each weaving is usually finished with an adornment of sea otter or beaver fur as was customary. With an awareness of modern concerns, I have finished weavings with hand-made cedar bark rope or wool braiding so as to alleviate any issue that may have arisen due to the use of fur. Chiefly robes of many styles were the masterful creations of weavers all along the Pacific Coast for centuries and are made to acknowledge and adorn persons held in high-esteem. It has been my privilege to weave the first entirely z-twist warp, weft and weave Raven's Tail Iitlagadaa (Chiefly) Robe on Haida Gwaii in over a century. This robe was woven almost entirely in public beginning at a family member's longhouse and continuing at a museum on Haida Gwaii. Following Haida Protocol, I held a Potlatch to unveil the robe. It is less usual for a female artist to hold a potlatch than for a male. It is my intention to do all that I can to contribute to the respect and public awareness of my art form, the art of weaving and the women who devote their lives to its gentle, consuming madness. According to protocol, a robe is not considered complete until its Validation or first dance which brings life and movement and spirit to what has previously been a stationary object. I danced the robe under the watchful gaze of Chiefs, Matriarchs and honoured guests. This was a powerful and humbling experience from inception to completion. I share one of my names Precious Potlatch Woman with my Great Grandmother Emily White (deceased). In accordance with Haida protocol this name requires me to maintain an active role of creating within Haida cultural practice. "At long last, with the learning of Raven's Tail Weaving, within me fused my love for textiles with the weaving that had always been a part of my life. I understood that I had found my passion. My family taught me about creating, tempered with patience, kindness and care. I weave because I could not do otherwise. Weaving fills my daylight hours and dances through my dreams at night. "After attaining my university degree, I sought new challenges by starting up two home decor boutiques in Victoria and Vancouver, Canada. This experience led to numerous designing, manufacturing and purchasing trips to Paris and Shanghai. These trips contributed to my passion for textiles and allowed me to experience the influence of cultural patterning and motifs inspiring artists of other countries. My family continues to play one of the most prominent roles in maintaining the discipline of Haida Art in Haida Gwaii, Canada and Alaska. Historically it was my Great Great Grandfather Tahayghen that first caught the attention of museum and ethnographical researchers and collectors during the last years of the 19th century. Known also as Charles Edenshaw, his pieces are prominent in numerous collections, including Pitt Rivers Museum, Oxford, England. Charles and his wife Isabella are an early example for me of the overlap and influence of artistic practice. Isabella was an exceptional spruce root weaver and Charles would adapt designs from his carving in painted form to adorn her hats and baskets. Other more current masters have received international and national recognition for their contributions. This includes weavers, Selina Peratrovich and Delores Churchill, Bill Reid, Robert Davidson, Evelyn Vanderhoop and Michael Nicoll Yahgulanaas. All of these family members, deceased and living, contribute heavily to my motivation to create art upholding the highest standards of quality and innovation. The smallpox epidemic that resulted after European contact decimated the Haida population. In the 20th century, the Canadian government banned potlatches in an attempt to extinguish the native indian way of life and encourage complete assimilation of natives. The smaller population of Haidas and the laws of Canada resulted in a greatly diminished artistic practice. I believe that each Haida has a personal responsibility to learn and carry on some aspect of Haida cultural practice whether it be in song, dance, carving, food harvesting, plant medicine, weaving etc. in order for our people to continue to hold onto a strong identity as a nation and to thrive. In order to shoulder my own responsibility, in recent years, I returned my attention to my traditional upbringing in weaving and focused on the art of Yelth Koo/Raven's Tail Weaving. I find satisfaction in the sense of contributing to an art form that was almost lost and in feeling a sense of continuity with my artistic family and culture. The challenge that I embrace is the ongoing mastery of this complex designing and weaving discipline. This challenge requires exposure not only to fellow weavers but also to pieces existing in museum collections throughout the world. My sense of accomplishment and my continuing personal encouragement lie in taking these varied inspirations of ancient weavings and contemporary weavings to create ancestrally harmonious pieces and also create a new variation of Yelth Koo. The Hageman-7idansuu Robe was an example of strict adherence to ancestral weaving strictures. An example of innovation in my development as an artist was the recently completed Wosk Woven Sea Robe. This robe was a marriage of the ancient form of Yelth Koo weaving and the button blankets that became prevalent for First Nations along the Pacific Ocean post European contact. After contact, the Haida were one of the tribes who adapted the industrial loom woven fabric and buttons that traders introduced to create a new version of the previously hand-woven robes. The pre-made fabric offered a quicker practical result of warmth, the status of owning something foreign and thus coveted, and yet another avenue for artistic expression. Haidas had long carved animal and human figures, both natural and supernatural, on totem poles, house fronts, serving bowls, canoes and so forth. They now adapted these designs in fabric and button form sewn onto the fabric and wore these as robes. These robes became more common. Later robes on occasion omitted buttons entirely and focused solely on the power of design created in fabric. The Wosk Woven Sea Robe consisted of a three-sided border of Yelth Koo weaving surrounding a Haida shark design made of ultrasuede and sewn onto wool fabric. The coloration of black, cream and yellow were ancestrally found in Yelth Koo/Raven's Tail weaving but the robe itself was modern in being only the third ever made and these all occurring in only the past 15 years. I am interested in exploring cultural overlap and inspiration while creating from a basis of respect to my heritage and respect of the cultural practice of the nations and territories that I visit. My artistic life is a direct result of my personal life and interior world. I would like to explore the creation of work that reflects travel and new influence and cultural overlap while continuing to be strongly and obviously Yelth Koo/Raven's Tail. I hope to contribute to the conversation exploring the concept of influence and innovation between different nations, tribes, cultures. In Haida recounting and North Pacific Coastal knowledge, trade and intermarriage between nations and the travel this involved often resulted in the transfer of artistic knowledge and its subsequent variation. I seek to create works of Art that have their roots in the history of the Haida and yet have a strong contemporary voice that reaches across boundaries to enhance awareness of this art in particular and weaving in general. Leather Moccasin Making. Tutored by Lineage elder Mary Swanson. Cedar mat weaving. Tutored by Lineage Elder Carrie Weir (deceased). Spruce Root Weaving. Trained by the pre eminent weaver on the west coast of Canada and Alaska Selina Peratrovich (deceased). Cedar bark basket weaving. Trained under Master Weaver Delores Churchill. Delores is a recipient of a 2006 National Heritage Fellowship From the National Endowment for the Arts, Washington, USA. Cedar Ceremonial hat weaving. Trained by Weaver April Churchill. Cedar harvesting and processing techniques. Trained under Weaver Holly Churchill. Yelth Koo/Raven’s Tail Weaving. Mentored by Master Weaver Evelyn Vanderhoop. Awarded her Master's of Weaving (2009). 1991-94 Malaspina University College: Nanaimo, B.C. 1994-96 Bachelor of Arts: University of Victoria: Victoria, B.C. 1994 Docent for Robert Davidson exhibition: Art Gallery of Vancouver: Vancouver, B.C. Names are given at formal ceremonies or potlatches in accordance with Haida law. Names are considered the highest form of property carrying a sense of immortality where material property is deemed symbolic and temporal. 2010 invited speaker for public programming of Haida Made: Harbourfront Centre, Toronto, Ont. 2010 SMASH: Art Gallery of Greater Victoria, Victoria, B.C. 2010 Time Warp: Bill Reid Gallery of Northwest Coast Art, Vancouver, B.C. 2010 Haida Made: Harbourfront Centre, Toronto, Ont. 2010/11 Relatively Edenshaw: Bishop's, Vancouver, B.C. 2012 Santa Fe Winter Indian Market. Santa Fe, NM, USA. 2006 Awarded Juried Commission from open call for Yelth Koo Weavers. This was a competition for a large group of candidates including very senior weavers. Commission involved weaving a full set of reduced-scale formal Potlatch regalia for the permanent collection of the new Museum at Kaay’llnagaay, Haida Gwaii, Canada. 2009 Award recipient of First People's Culture, Language and Heritage Council grant. 2010 Awarded First Place in Textile Category at World Art Market at University of British Columbia's Museum of Anthropology. 2010 Awarded British Columbia Achievement Award for First Nation's Art by Premier Gordon Campbell. 2011 SWAIA Residency Fellowship - One month artist in residence at the Santa Fe Art Institute.